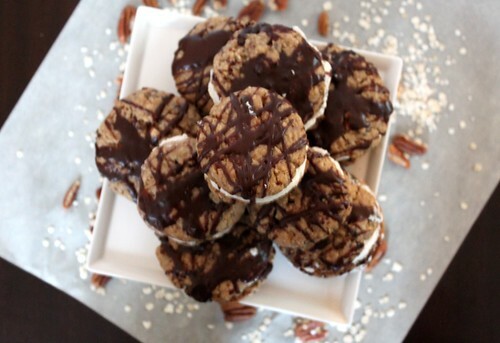 These babies have been on my “To Make” list for a long time, but they are the kind of cookie that you absolutely cannot make unless you have people to share them with (or have better will power than myself ). So when our friend planned a dinner party, , I immediately knew that I wanted to bring these. Everyone enjoyed them, but I think they are a new personal favorite of mine. The cookie itself is to die for. If you don’t want to go to the trouble of making the whole sandwich, just make the cookies- you won’t be sorry. They have chocolate chunks, pecans, dried cherries, oatmeal and brown sugar. Then sandwiched between that goodness is a marshmallow frosting. If you really want to get fancy, you could try toasted marshmallow frosting instead. And if you aren’t drooling yet, on top of all that is a dark chocolate ganache. The only problem I had with these was that they are very messy if you try to eat them right after making them. For a more refined dessert, just place them in a fridge for at least an hour before serving. 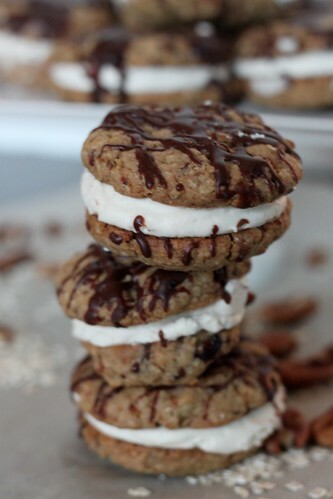 And since these taste so good cold, I think chocolate oatmeal ice cream sandwiches are in store for later this summer. Perhaps I will make some toasted marshmallow ice cream to go with them – because a cookie as fabulous as this can’t settle for plain old vanilla. Preheat the oven to 325˚ F. Line baking sheets with silicone baking mats or parchment paper. Combine the flour, baking powder, baking soda, and salt in a medium bowl. Whisk to blend, and set aside. 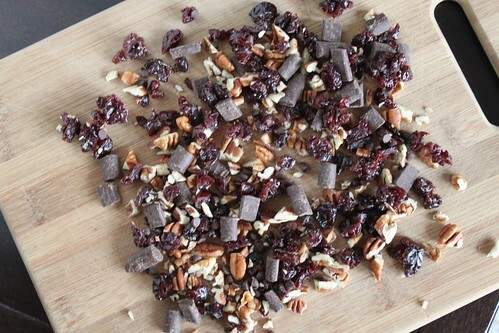 In a large bowl, combine the oats, cherries, pecans, and chocolate. In the bowl of an electric mixer, beat together the butter and sugar on medium-high speed until light and fluffy, about 2 minutes. Blend in the egg and vanilla. With the mixer on low speed, add in the flour mixture, beating just until incorporated. Fold in the oat mixture with a spatula until incorporated. Use a scant ice cream scoop or a 1 oz cookie scoop to shape dough balls. Place the dough balls on the prepared baking sheets, spacing each 2-3 inches apart. Bake for 14-18 minutes, until cookies are light brown in color. Transfer to a wire rack and let cool completely. Match the cookies up in pairs by size. Fill a pastry bag fitted with a large plain round tip with the marshmallow filling. Pipe a dollop of filling onto the flat side of one cookie of each pair, and sandwich the cookies together, pushing the filling to the edges. To make the ganache, place the chopped chocolate in a medium bowl. In a small saucepan, bring the cream to a simmer over medium heat. Once simmering, remove from the heat and immediately pour over the chocolate. Let stand 1-2 minutes. Whisk in small circular motions until a smooth ganache has formed. Whisk in the butter until completely incorporated. Let the mixture stand at room temperature until slightly thickened, about 10 -20 minutes. Drizzle over the assembled cookies. Chill to set the ganache and stabilize the filling. The original recipe called for deep frying tortillas, but after my recent frying disaster, I chose to make them in the oven instead . It was actually a good reinforcement that never again do I need to fry anything, because the “chips” still came out crisp and delicious without having to mess with hot oil. In fact, I think cinnamon-sugar chips would be a pretty great snack on their own – so next time I will likely make a double batch. 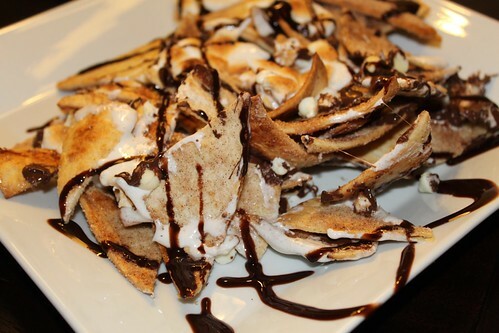 The recipe itself is pretty self-explanatory, but I’ll have to say Lesley must be some kind of genius for thinking up the idea of “S’more nachos” in the first place! If you really want to go crazy, you could try using ice cream as a dip for these nachos. I’m sure this would be fabulous – warm cinnamon chips against cool ice cream – but you might have to skip dinner all together if you want to try that. So if you don’t have the pleasure of a campfire this Fourth of July, make this instead….It’s definitely easier than building a fire ;-). Preheat oven to 350°. Mix cinnamon and sugar together in a dish. Using a pastry brush, spread melted butter onto both sides of the tortillas. Sprinkle 1 side of each tortilla with a covering of cinnamon-sugar mixture. 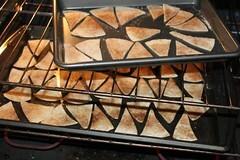 Using a kitchen scissors (or knife), cut each tortilla into 8-10 triangles. Without overlapping, place triangles sugar side up on a large baking sheet and bake for 10-15 minutes or until the edges turn up. Remove chips from oven and combine into a pile on a small baking sheet or oven-proof dish. 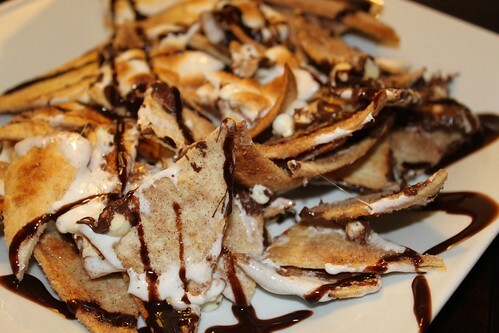 Sprinkle with chocolate chips, white chocolate chips and marshmallows. Turn the oven on broil, and place the baking sheet on the middle rack (too close to the heat will catch your marshmallows on fire). Watch carefully until the marshmallows are browned, about 5 minutes. 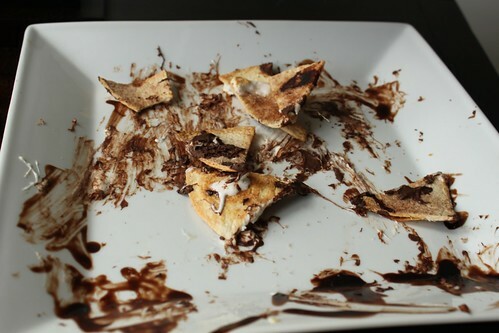 Remove from the oven, transfer to a serving dish and drizzle chocolate syrup over the chips. Serve warm. – Nachos Adapted from from Straight From the Heart by Lesley B. Fay.